Pest description and crop damage Adult spittlebugs are wedge-shape, grayish brown insects about 3 mm long, and similar in appearance to leafhoppers but are larger and stockier. They jump and fly readily. The young spittlebug nymphs are white to lemon-yellow in color and look like fat aphids. They encase themselves in a frothy spittle. Nymph feeding causes twisting of leaves and thickening and shortening of stems of fruit spurs. When this occurs, the yield is likely to be reduced. 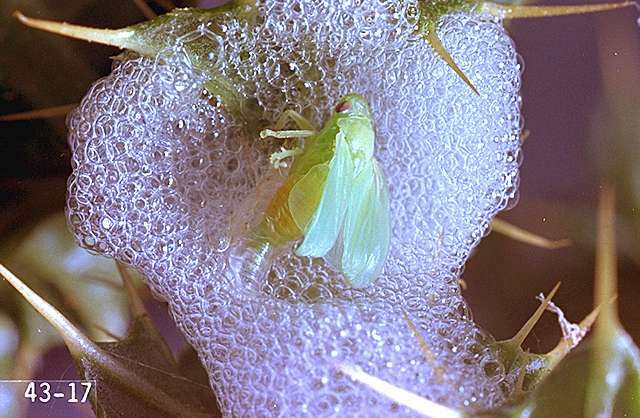 Nymphs develop in masses of spittle on plants. 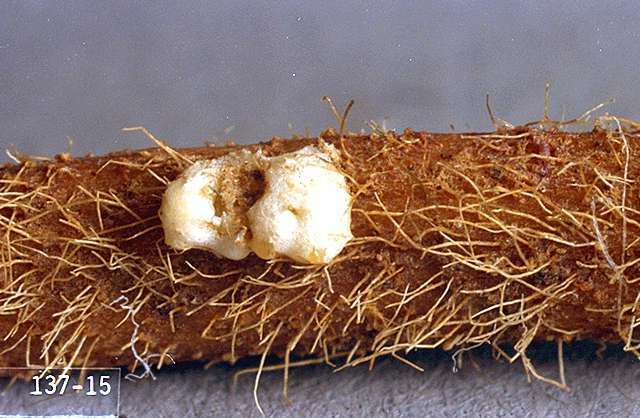 Biology and life history The insect overwinters as eggs on the plant or in plant debris. The eggs hatch in early spring, and the first spittle masses are found in April just before bloom. Spittle masses are abundant from then through harvest. The first adults appear in May and lay orange eggs on the plants during harvest and after. There is only one generation per year. Scouting and thresholds Inspect plants prior to bloom for eggs and egg hatch. Just before or at bloom, inspect plants for spittle masses. On June-bearing cultivars, cut all the old leaves off the plants after final harvest to renew the foliage and remove egg masses. Home gardeners: Nymphs are easy to remove by hand-picking. Also, a strong spray of water will knock them off the plant, preventing more damage. Controlling spittlebugs with chemicals is almost impossible once spittle masses form. Control with chemicals is almost impossible once spittle masses form. Make treatment applications before significant spittle masses are formed and before nymphs are more than half grown. carbaryl (Sevin and other brands) at 1 to 2 lb ai/a. PHI 7 days. Latex-based formulations such as Sevin XLR Plus are less hazardous to bees. Do not apply to bloom. chlorpyrifos (Lorsban and other brands) at 0.94 lb ai/a. PHI 21 days. Use pre-bloom only, not during bloom when bees are present, or when fruit is present. Restricted use pesticide. imidacloprid (Admire Pro and other brands) at 0.047 lb ai/a. PHI 7 days. Do not apply during bloom, within 10 days of bloom, or when bees are actively foraging. Note "Bee Advisory Box" and restrictions on the label. malathion (several brands) at 1 to 1.88 lb ai/a. PHI 3 days. naled (Dibrom) at 0.9 lb ai/a. PHI 1 day. Do not apply to bloom. Restricted use pesticide.